PHOTO: Allen Ramsey, DWCPhoto.com. Highlands junior offensive lineman Kyle Finfrock (72) blocks Woodford County senior defensive lineman Drake Jackson (52) during Friday's Class 5A First-Round Playoff game. Jackson is committed to the University of Kentucky. PHOTO: Allen Ramsey, DWCPhoto.com. Highlands senior linebacker Ben Ziegler (34) gets pressure on Woodford County quarterback Trey Thurman (17). Highlands won 50-14. None of the current coaches were on staff the last time the Highlands Bluebirds football team lost in the first round of the playoffs. 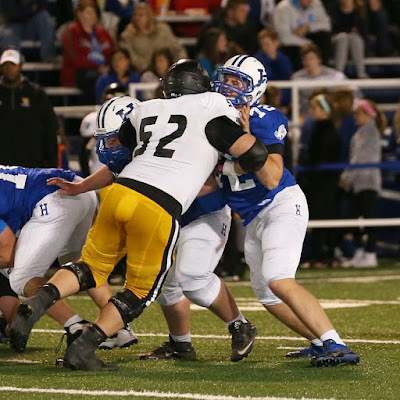 The Bluebirds (6-5) extended their streak of first-round victories to 24 with a convincing 50-14 win over the Woodford County Yellow Jackets (3-8) on Friday at David Cecil Memorial Stadium dating back to 1991. Highlands lost 20-14 at Montgomery County in the first round of the Class AAA playoffs that year. Current Highlands Head Coach Brian Weinrich has been on staff for 21 of those wins. He became an assistant in 1995 and took over as Defensive Coordinator in 2002 before becoming the head coach last year. The average margin of victory for the Bluebirds is 40.5 points during that streak. The biggest victory came by 64 points at 70-6 over Boyd County two years ago. The closest win came in a 28-22 win over Lexington Bryan Station in 2008. The Bluebirds won in the final minutes when Tony Guidugli hit Austin Collinsworth for the game-winning touchdown pass. Highlands also won its 28th straight home playoff game. 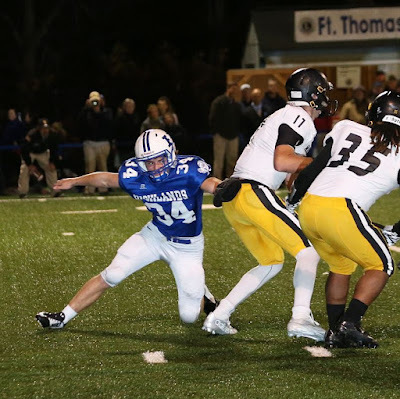 The last time a team came to Fort Thomas and beat the Bluebirds in the playoffs came on Nov. 18, 2005 when Lexington Catholic shut out Highlands, 17-0. Woodford County has been part of both streaks. Highlands also beat the Yellow Jackets, 70-8 in the first round of the Class 5A playoffs in 2010. Highlands senior kicker Jared Dougherty made six point-after touchdown kicks in the victory to extend his Highlands and Northern Kentucky record to 191 career PATs. He needs nine more to become just the seventh kicker in Kentucky history to make 200 or more career PATs. Dougherty moved into a seventh-place tie in Kentucky history with former Owensboro kicker Logan Johnson. Johnson played on the Red Devil teams that lost to Highlands in the 1999 and 2000 Class 3A state championship games. Next on the list is former Hazard kicker Austin Delpont at 200 career PATs and 201 by former Louisville Trinity kicker Karl-Heinz Williams. The Kentucky record is 297 held by former Scott County kicker Palmer Ward and former Lone Oak kicker Jack Coorts. District 5 came just two points from sweeping the District 6 competition Friday. Covington Catholic (4-7 overall) handled Anderson County (5-6) pulling away for a 47-21 victory. The Colonels led just 13-7 at halftime. Dixie Heights (3-8) traveled to Mount Sterling and beat the Montgomery County Indians (7-4) by a 21-17 count. The Indians led 10-0 at one point and played without junior running back Alex Harvey. Harvey rushed for 1,202 yards during the regular season. But down in Berea, Grant County (4-7) nearly pulled off a major win over the District 6 champion Madison Southern Eagles (5-5). The Braves scored with 4:55 left in the game to pull within 28-27, but Grant County went for two and the Eagles stopped Brave fullback Hunter Lawson on the conversion run. The Braves received the ball back with two minutes left but could not go ahead. This marked the first time Grant County made the playoffs since 2008. Host teams went 14-2 in the first round of the Class 5A playoffs Friday. Besides Dixie Heights, the only other team to go on the road and win was the Lincoln County Patriots. The third seeds from District 7 ventured to Harlan and beat District 8s second-seeded Harlan County Black Bears, 40-35. The Patriots face the defending Class 5A champion Pulaski County Maroons in the second round Friday in Somerset. The Maroons handled the visiting Letcher County Central Cougars, 49-22. The Highlands state runner-up team this past spring was honored at halftime. The Bluebirds finished 35-7 and set numerous team and Kentucky state records. The Bluebirds beat the Colonels, 42-7 on Oct. 9 pulling away in the fourth quarter with 21 points. Highlands rushed for 255 yards in that game led by Nick Kendall's 115 yards on 26 carries and two touchdowns. Highlands took advantage of four turnovers in the win. The Bluebirds recovered three Colonel fumbles and intercepted another pass. Highlands has seen this happen before. The Bluebirds beat the Colonels, 42-28 in 2010 in the second round of the Class 5A playoffs after beating Woodford County to open the playoffs. The Bluebirds also beat the Colonels twice in 2009.